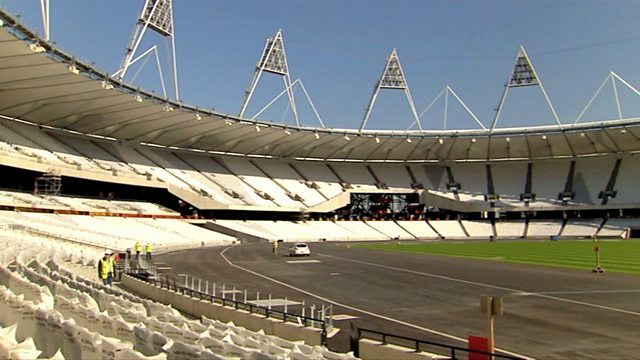 Aled Jones gets to look around the new Olympic Stadium in London, and introduces some spectacular hymns and songs from Britain and beyond. Browse content similar to Olympic Countdown. Check below for episodes and series from the same categories and more! by the teachings of a Dominican priest 100 years ago. where this time next year, the 30th Olympic Games will be taking place. So it's on your marks, get set, go! 'In just over a year, London will host the Olympic Games. you're guaranteed an experience you'll never forget. in the glorious surroundings of the Royal Albert Hall. 'Construction at Olympic Park started five years ago. whose mission was to turn Britain's Olympic dream into reality. At its height, the workforce reached 16,000.
fire service, even police force. 'And this building site is the last place you'd expect to find a vicar. 'But it's a community, like any other. -Well, I used to be a policeman. -Right. How did you get that job? into the Church of England. in my last few years in the police. to take on the role of chaplain for the construction workforce. It was an opportunity that won't come again, so take it with both hands. This has got to be the biggest parish ever, hasn't it? Everywhere you look, there are workers, construction going on. As a parish, it's unique. Because we've got no children and we've got no mums and toddlers clubs. But we do have a lot of fellas away from home, not seeing their family. I'd love a look around. Shall we go for it? You'll definitely know our next hymn - For All The Saints. who was actually Bishop here, in the East End of London. Were people a bit reticent to start with, coming up to you? Initially, they were. They didn't understand what we were about. that's when we really couldn't cope. Because you could have them queuing up to come and talk to me. And we're just generally there for them. So, it's not a case of you evangelising? You're not here to try and convert people? "You'll never make me a Christian." "than I have of making you a Christian." albeit a Christian faith, we are here for everybody. Because we are all God's children. So we are here to look after them for him. 'from all different backgrounds and faiths. 'It's also created lots of employment. Tell me a bit about what you do here. Well, I'm an apprentice on this Olympic site. You must be very proud when you look at that sight. Oh, yes. I'm really proud. it was just all mud and just rubble. And to see what it looks like now, I'm just proud to be a part of that. Is this the sort of place you're going to bring the family? to say, you know, I helped to put in those trees. I did those hills there. I helped to plant those plants. Is this work for you or is it pleasure? so the whole job itself is a pleasurable experience. All the athletes will have one thing in common - the will to win. Sport isn't just about competition. It can unite nations and bridge barriers. I found out exactly how sport can change the world. 'was underlined at the 1995 Rugby World Cup. 'But, for the country, the tournament had a deeper resonance. to unite and reconcile a divided country. 'who took his players to Robben Island during the 1995 tournament. I stood in that cell, and he was on Robben Island for 17-odd years. And it was just a small cell with no view, really. Because now I've met him, we've spoken about many things. He came to the opening - just before the opening game, he came to see us. We got a voice coach in to teach us how to sing. And the players loved it. They were training in the showers. We laughed at each other when it came to the pronunciation. Some of the forwards just couldn't pronounce some of the words. It was important for us to be able to sing our national anthem. 'In the final, the Springboks faced the favourites, New Zealand's All Blacks. And he wore a Springbok on his heart. Never did we know he was going to be there. as it were, in the days of apartheid. He stood with a Springbok on his heart and he said good luck to us. And when he turned around, my number was on his back. because I knew I would cry. I knew I would just cry, because I was so proud. and the tears were rolling down their cheeks. They were also incredibly proud. until they have to drag us off the field that day. to say thank you for the privilege of playing in this wonderful match. And before I knew it, everybody just stormed around me. And the whole team was around me on their knees. and everybody bowed their heads. That's when all the emotions of the six weeks just came to the floor. We said thank you for the opportunity to play in the World Cup. showed their faith and belief in such a way. As we can see, the stadium is completed. Everything around it almost completed. -Does that mean the end of your role here? but I still run a parish. I've got plenty of people I've got contact with. So I've got a continuing role. and being available to these people. and to share part of their life. Has your faith changed in the time you've been here? It's got stronger and stronger and stronger. Because you can see God at work in everything here. You really can. and seeing this work going up, God has got to be in this. The piece of music you chose reflects the time you've spent here. "We are all God's children and we are seeking God's grace." praying that everybody receives God's grace. 'of being humanity at its best. 'and guide us in living your gospel. For some athletes, this will be the greatest moment of their lives. The hard work will have paid off. It's the finishing line. Look, I've just won a race. Mind you, it was only me competing. I'd love to be here in 12 months' time. Imagine this stadium full - 80,000 people cheering. The atmosphere's guaranteed to be electric. Grab a pen and paper, because here we go again. which takes place on Sunday 11th September. "From where?" I hear you ask. You've guessed it. The Royal Albert Hall. as opposed to outside in the cold, then don't miss the boat. you can watch from the best seat in the house - at home on your telly. I'll be there. See you soon.